Democrats went to bed not knowing whether their candidate for governor -- Mike Hatch -- won, but very early yesterday evening DFLers enthusiastically celebrated their Senate candidate's triumph. Just minutes after the polls closed at 8, the Associated Press declared Amy Klobuchar -- not Republican 6th District Congressman Mark Kennedy -- the winner. 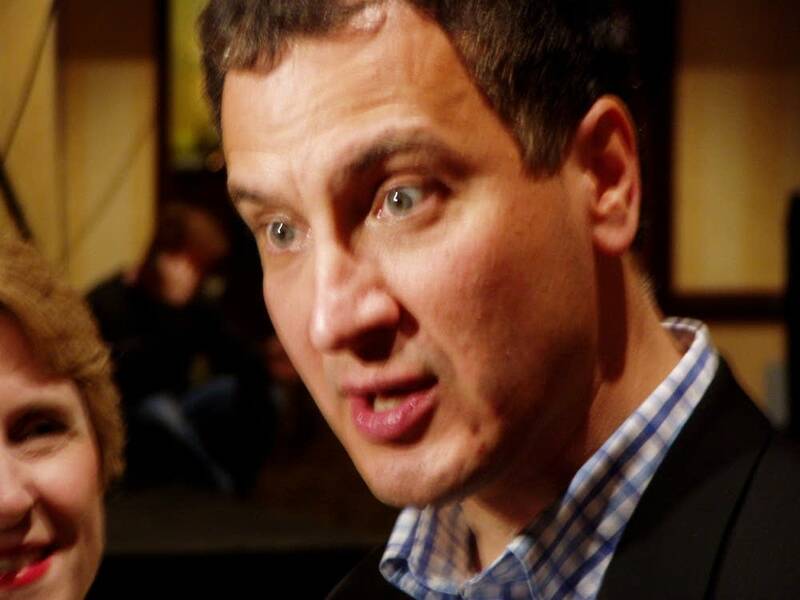 When Democratic Sen. Mark Dayton announced early last year he would not seek re-election to a second term, the consensus locally and nationally was that Minnesota's 2006 Senate race would be one of the nation's most fiercely contested. But after the parties settled on their candidates and the campaign got underway, polls consistently showed Klobuchar was more popular among Minnesota voters than Kennedy. From the podium in a ballroom of a hotel at the DFL's downtown St. Paul election headquarters, Klobuchar, her husband, and young daughter at her side, quoted former Minnesota Sen. Hubert Humphrey. It's Humphrey's seat Klobuchar will soon occupy. "As he once said, 'I have loved my country in a way that some people consider sentimental and out of style. I still do and I remain an optimist with joy without apology about this country and about the American experiment in democracy.'" Following Humphrey's death his widow, Muriel, became the first woman to represent Minnesota in the U.S. Senate. She served in her husband's place for several months by appointment. Klobuchar has become the first woman Minnesotans have elected senator. "Today you had the chance to raise your voice for change and you did it," she said. 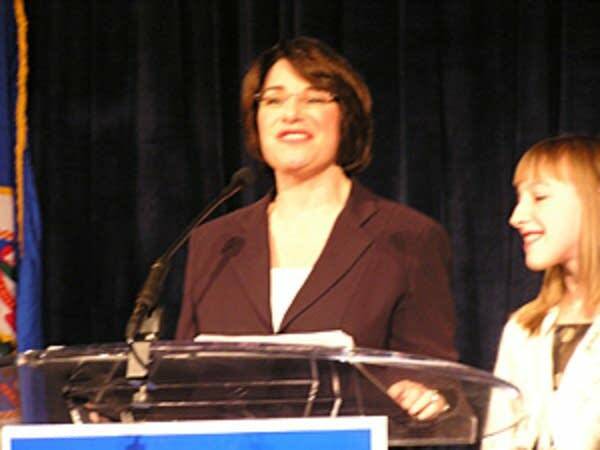 Throughout her campaign, Klobuchar criticized Kennedy for his record of almost always voting with President Bush and the Republican Party. During her victory speech, Klobuchar vowed to represent all Minnesotans. She talked about placing more emphasis on renewable energy, affordable health care and a new direction in Iraq. "In this campaign we have reached out to Democrats, to Republicans and to Independents. We have reached out to all of you who have told me you are tired of that 24-hour TV shoutfest about what's right and what's left and you want to talk about what's right and what's wrong," Klobuchar said. 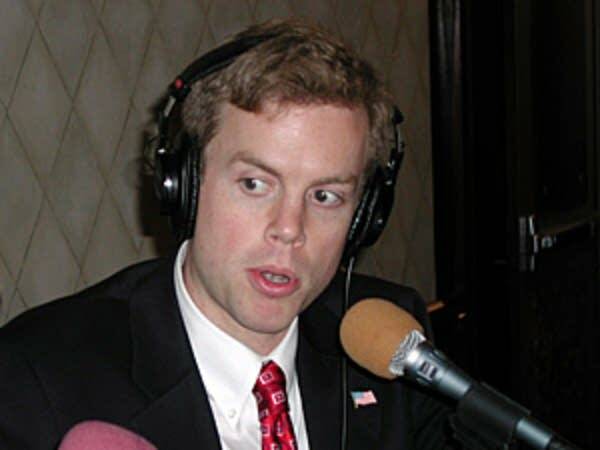 On the other side of the Twin Cities, Republican Mark Kennedy conceded defeat before a considerably more somber crowd of GOP supporters assembled at a Bloomington hotel. "I do believe that in the end this is a race that is not our year. I called Ms. Klobuchar to congratulate her on her victory," Kennedy said. "Even though the results are not what we wanted, there is no shame in defeat . There is only shame if we don't fight. We fought hard. We fought through the line, we fought a good campaign," he said. As Klobuchar prepares for life in the Senate, Kennedy, who was elected to Congress in 2000, will be getting ready to leave the House of Representatives. He pledged to continue talking about national security and the threat he says Islamic extremists pose to the United States. "And let me close by quoting 2 Timothy. 'I have fought the good fight. I have finished the course. I have kept the faith.' Let us keep on with the good fight. Let us keep running through the course. Let us keep the faith," Kennedy said. Independence Party candidate Robert Fitzgerald, who was included in most of the Senate debates, finished far behind Klobuchar and Kennedy with about 3 percent of the vote.